Needless to say, we're not having a promising summer thus far. Its cold. Its wet. Its Scotland. One certainly doesn't move here for the weather. In spite of the cold, we are just going about our business of pretending its summer. We continue to spend most dry minutes out in the garden. Yes, sometimes it has been huddled in blankets with hot cocoa, but one thing you learn when living in a country-sized rain shadow -- seize the sunny moment. No matter what the weather is telling us, we are looking for other signs of summer...the wild strawberries have taken the slightest shade of pink. This then resulted in a 25 minute-long explaination to 2 three year olds that they STILL needed to wait for them to be bright red before they could be eaten. ("They'll make your tummy sick if they aren't ripe," was the winning argument for 2 boys who both recently had the D&V bug). But at least one of our seasonal rituals has returned. 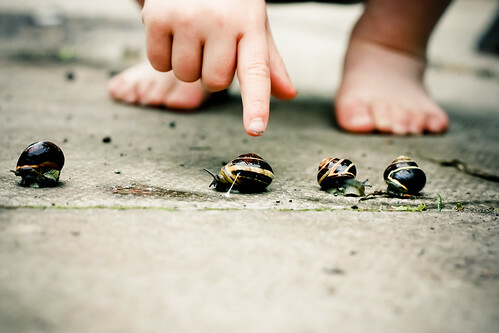 This weekend, we held our annual snail race. 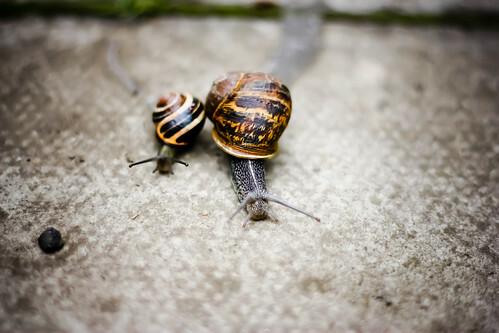 Twenty snails entered the race, but the vast majority were disqualified for going the wrong direction and climbing on top of competitors. It is so wonderful to see the change in Ellis. Where last year he was a bit fearful of the snails, this year, he was chief (gentle) poking officer. In the end, it was a close one, but once the enormous snail from the compost pit decided to go, there was not stopping it.